This 60″ dia. x 20′ OAL elbow pressure balanced expansion joint was refurbished by U.S. Bellows in 3 weeks for a power generation plant in Wisconsin. 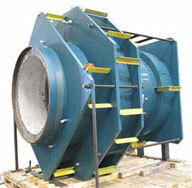 The bellows are fabricated from Inconel 625 and the duct, elbow, cover and liner of carbon steel. The expansion joint was designed for 1″ axial movement at 715°F and 185 psig. The bellows longitudinal seams were 100% x-rayed prior to forming. After replacing the bellows, the expansion joint was dye penetrant tested and hydro tested at 185 psig. 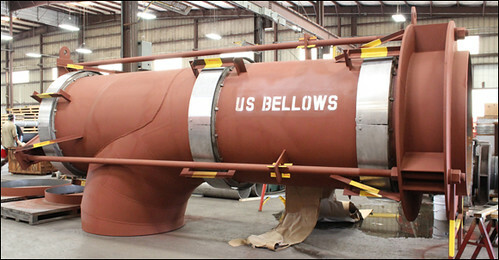 U.S. Bellows refurbished a 54″ dia. custom crossover expansion joint for a power plant in Kansas. The flow end and balancing end bellows were replaced. The pressure balanced expansion joint was designed for 1″ axial movement at 700°F and 150 psig. 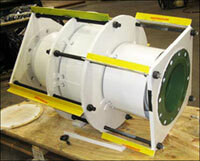 The bellows longitudinal weld seams were 100% x-rayed and the assembly was hydro-tested at 180 psig prior to shipment. The refurbishment was completed in three weeks to meet the customer’s outage requirements. 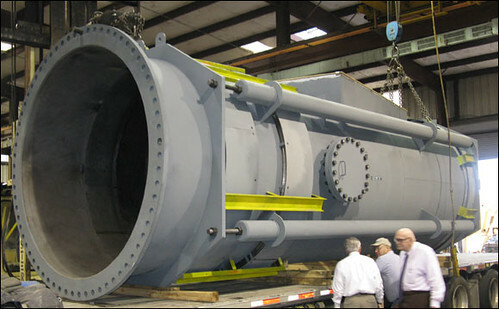 This pressure balanced tee expansion joint was custom designed for a boiler feed pump turbine exhaust in a power plant. It is 96″ Dia. x 288″ OAL and fabricated from carbon steel with 304 stainless steel bellows, turning vanes and liners. It is designed for 2″ axial movement at 315°F and 15 psig. The expansion joint was dye penetrant examined, and a chemical cleaning of the interior surfaces was performed to remove any oil and grease. U.S. Bellows also performed a pneumatic test at 23 psig. This pressure balanced elbow expansion joint is 60″ diameter and 240″ overall length and was custom designed for a power generation plant in South Carolina. It was fabricated from carbon steel with 304 stainless steel bellows. The expansion joint was designed for an axial compression of 1″, lateral of 1″, and 100 PSIG at 100°F. These expansion joint components were fabricated for a pressure balanced expansion joint in a nuclear power facility in Pennsylvania. They are 46″ square, fabricated from carbon steel duct with Inconel 625 bellows, and 321 stainless steel liner. The design conditions were +/- 0.875″ axial compression, 1,346 lb./in. lateral spring rate and 15 psig at 250°F. All welds were 100% dye penetrant examined and a pneumatic pressure test at 15 psig was conducted prior to shipping. The pressure thrust produced by low pressures can be tremendous in large diameter systems, just as it can be at normal pressure ratings in small pipes. To avoid expensive anchors, to keep long pipe runs in tension, to prevent buckling, or reduce reaction forces on equipment, the pressure in the pipe can be used to generate balancing forces within the expansion joint. These combinations of bellows and thrust restraining structural components can accept almost any combination of movements, as shown in the following examples. The pressure balanced elbow is ideal for absorbing the thermal expansion of equipment, such as turbines, pumps and compressors, which rely upon low reaction forces on their inlet and exhaust flanges. In this example, only an intermediate anchor is provided at the elbow, to isolate the equipment from any forces produced in the remaining piping. The pressure thrust force produces tension on the equipment flange, but the only forces produced by the deflection, are the spring resistance of the bellows within the expansion joint. The spring rate of these units is the sum of the spring rates of the bellows on each side of the elbow, and care must be taken to provide a unit which produces spring forces low enough to satisfy the equipment maximums as stated by the equipment manufacturer. Bellows may also be cold sprung to reduce these forces even lower. Example of how the flange is subjected to an axial force equal to the pressure thrust. In this example, which may be typical for a turbine exhaust application, the force on the machine’s flange is the spring reaction of the bellows in lateral deflection, as described in the above example. Again, the flange is also subjected to an axial force equal to the pressure thrust, as if it were capped, but the turbine’s mounts are not. The pipe guide between the expansion joint and the equipment flange absorbs the forces produced by the thermal expansion of the pipe, along its axis. View all the examples in the full article on, Pressure Balancing Expansion Joints. When applications exist where anchoring is impractical for structural or economic reasons, such as an elevated piping application or short, straight pipe runs between two large vessels, the in-line pressure balanced expansion joint is a powerful solution to a difficult design problem. The principle of this type of unit is essentially the same as the pressure balanced elbow type, in that the pressure thrust from the two flow bellows is compensated by the pressure thrust generated by the larger balancing bellows. The in-line pressure balanced expansion joint is designed to absorb axial movement and/or lateral deflection while restraining the pressure thrust by means of tie devices interconnecting the line bellows with outboard compensating bellows also subjected to line pressure. Each bellows set is designed to absorb the axial movement and usually the line bellows will absorb the lateral deflection. This type of expansion joint is used in a straight run of piping. The expansion joint assemblies are fabricated entirely from stainless steel with a design pressure of 50 PSIG. They are designed with tie rods that do not permit axial movement, but allow for lateral movement up to 1/2″. The expansion joints will be used on a process line that contains exhaust gas and hydrocarbon vapor at a low concentration. It will connect an oil tank with a vapor control system. The expansion joint assemblies are fabricated for a 12″ pipe and are designed for 2-1/2″ lateral movement. The design pressure is 276 PSIG with a design temperature of 626°F. 316L stainless steel was used for the bellows and tie rods. The expansion joints include 300 lb. raised face stainless steel flanges to accommodate low spring rate requirements. Hinges cause the unit to bend in a single plane. The hinge mechanism is designed to accept the full pressure thrust. 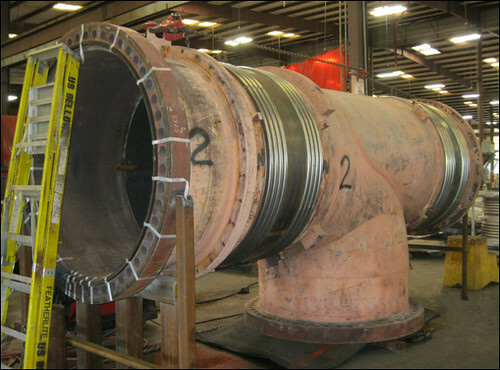 The expansion joints are fabricated for a 36″ pipe and are designed with Inconel® 625 grade LCF bellows. They include a liner provided with drain holes to prevent accumulation of corrosive condensation. 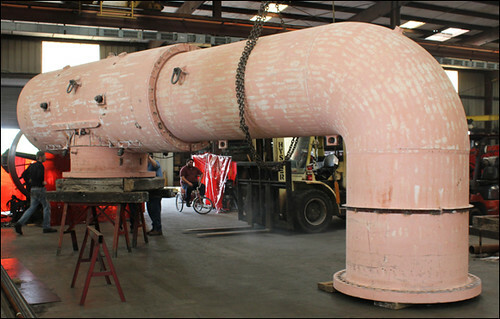 These expansion joints are fabricated for a piping system in a steam plant. They include 304 SS bellows and carbon steel shell and flanges, and are designed for 150 PSIG and 350°F. 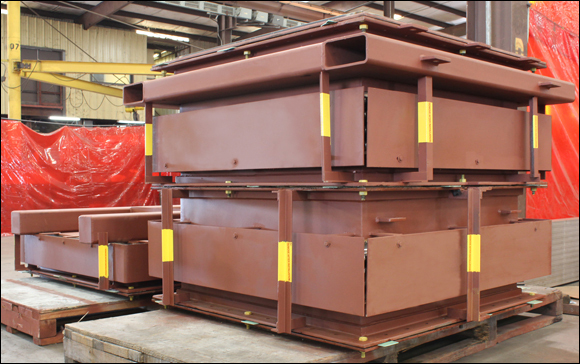 These expansion joints are designed for a 55″ diameter overhead vapor line at a refinery. The overall length is 310″ and the bellows are fabricated from 625 LCF. The expansion joint is designed for 50 PSIG and 1075°F.